Review, specs and unboxing of the Bone Conduction Headphones Trekz Titanium by AfterShokz. These headphones are high quality and they fulfill what they promise, because you can listen to music without having something that obstructs your ears to avoid annoyances, infections, etc. NOTE: These Trekz Titanium headphones do not make your cheekbones temporary and sphenoid vibrate. These do not cause youe headaches or another discomfort, nor during your training time at the gym, park, etc., nor after the end of your workout session. Here in this article I will show you the unpacking (unboxing) of the Trekz Titanium headphones. I will show what came in the box once they arrived (they were sent from the United States), and also of course I will tell you my experience with these bone conduction headphones, some points in favor and other points against, and other aspects to take into account take advantage from this "Hear it All" experience. It should be noted that the headphones I ordered were the Trekz Titanium Slate Gray AS600 in its normal version, so they are color gray/black. But there are also Fuchsia (intense pink), oceanic blue and ivy green, and also come in mini version (with a smaller diameter) for smaller skulls. In what type of activities this Trekz titanium bone conduction headphones can be used? You can use them while you are riding a bicycling, while you are jogging on the street, while you perform your weight lifting training routine, while calisthenics workout, among other options. However, I do not know if wearing these headphones while you practice Parkour might be a viable option since the movements that take place in this sport branch are too abrupt and maybe these headphones may fall and hit the ground. I have tried the Trekz Titanium performing Hand Stand Push ups and the "grip or fit" feels very stable on my skull. But in the Parkour the movements are much more abrupt, so it's up to you whether or not you want to try these headphones to perform all this type of Parkour maneuvers and exercises. What I can assure you is this Bone Conduction Headphones do not work while you are swimming or practicing any other aquatic sports because they do not have IP 68 certificate, but simply come with a IP 55 certificate which makes them resistant to sweat and rain (although I do not think it's a good idea to use them while jogging during heavy rain. I do not recommend it in order to keep Trekz Titanium durability and your health and physical integrity. You can use your Trekz Titanium Headphones to perform traditional weight training rotuines, Crossfit, Functional training, etc., without any problems. However, if you plan to perform long-distance movements, you should obviously either keep your Smartphone in your pants pocket or simply buy a device that suits your arms or legs which also support your smartphone, because this device (your smartphone) will be the one that provides music to these bone conduction headphones. Why do I mention the above? Because you may think that these Titanium Trekz by Aftershokz have some spot to adapt a micro SD card and be able to listen to music without using a smartphone or other device with Bluetooth. But this is not true. These headphones are only responsible for reproducing sound thanks to an external source that contains bluetooth connection, in this case talking about the most common that would be a smartphone. So far I can tell you that these Bone Conduction Headphones are pretty good in every way. The sound quality they reproduce is very good. Maybe in songs with lot of bass and very high volume, these headphones may vibrate too much and may be a little annoying (still a tolerable vibration), but be aware that what vibrates are not your bones but the speakers of the headphones, so do not worry about this. The truth is that they fit very well on your skull, there is no problem about these falling to the gorund easily for example performing exercises such as the aforementioned Hand Stand Push ups, jumping, running at maximum speed, performing exercises such as bounces or jerks, etc. However, there are some movements that can make for a thousandth of a second that any of the speakers may "peel off" minimally from your cheekbones, so you would stop listening the sound for that small instant of for example this happens too when you laugh out loud. Well, I emphasize that these bone conduction headphones arrived to my home from the United States and I acquired them through a seller on eBay, at a price of 99.95 US dollars, plus approximately 27 dollars that cost me the shipment, and it took almost 5 weeks to arrive to my place here in Colombia (it took more than the estimated time that eBay shows when you want to buy some product). I paid These Headphones on August 27, 2017 and they were sent to me on August 28 of the same year, and although the estimated maximum time of arrival was September 17, 2017, these Trekz Titanium came to me on Wednesday, October 4 2017 to my city of residence: Cali, in Colombia. Of course I was exchanging emails with the seller but he told me to please wait because usually these shipments took a little more to arrive than estimated time eBay shows, and as I am a patient and understanding person, I decided to wait (and I do not regret it, because the wait for these Headphones was worth it). The presentation of the box of these headphones is very simple and at the same time is very eye-catching. The packaging in which they traveled was safe, I did not have any problems they suffering any damaged. This is the note whic clarify purchase it serves so that you can corroborate the price of the headphones without the shipping cost which varies to every country. 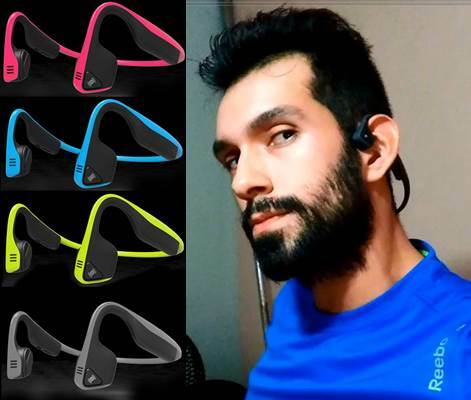 - "Bone conduction technology delivers sound through the cheekbones". - "They have PremiumPitch Stereo Sound ". - "IP 55 certificate that makes them resistant to sweat". - "They come with a lightweight Titanium frame". - "It has dual noise canceling mics". - "multipoint pairing". Stereo Sound - "OpenFit Design". - Something very interesting to note is that these Trekz Titanium Headphones have a battery life of 6 hours to listen to music and / or make calls. By the way, the quality to make calls, both for talking and listening, it's excellent. Perhaps you wonder, how can you do so people can hear you clearly during a call? You do not have to move the headphones closer to your mouth. Simply in the position where you must keep them (around your skull), there they will pick up the sound of your voice so that the person who you speak to can clearly hear you. With the multifunction button located on the left side you can answer and hang off calls and also this buttons works as the Play and Pause function when you are listening to music. In the interior side where the power / off / volume + and volume - buttons are located, we can find an indication which explains us how to be able to connect these headphones via Bluetooth to our smartphone (it's a very simple thing). Well, below will explain how to set up and use them for the first time. Inside the box we can find Trekz Titanium bone conduction headphones, the USB cable to charge it by connecting it to the Laptop or PC (I do not know if a cell phone charger can be used or if it is too much amperage that could damage these headphones, because there are no indications in the manual about this). We can also find two rubber devices to adjust the diameter of the headphones a little, some earplugs in case we do not want to hear the noise of the environment and people, the basic instruction manual, a bag to store them, and the warranty card that comes with a code to register it on the Aftershokz website. How to charge the battery of the Trekz Titatium AfterShokz headphones for the first time? The indication you have to observe to know if your Trekz Titanium headphones are fully charged, is that when you connect them to your pc through the USB cable, the LED that appears next to the power / off / volume + button illuminates color blue. When they are not 100% charged, this LED light will illuminate a red color. Unfortunately we do not have an indicator that lets us know the percentage of the battery of the Trekz titanium bone conduction headphones . However, if they have enough charge and if wear them without listening to music, then by pressing the volume button + you will hear a warning that says "Charge high" (in this case we are talking you have enough charge to go for 4 hours or more, more or less). The first time I connect them to my Desktop computer to charge their battery, just after removing them from the box, I only let them charge for half an hour because I really wanted to try them as soon as possible and I was almost going to the gym. Well, this time it was enough to be able to use them for two hours, and still I think they could have lasted a little longer since they did not shut off during my workout time. I think time to have the battery fully charge (100%) is about an hour, so it can last the usage time that is promised, time that is in 6 hours both to listen to music and to make calls. NOTE: The Trekz Titanium headset manual does not indicate whether or not to use a smartphone charger. It only says that the USB cable that comes with it serves to charge their battery. I did not dare to charge them using something different. I always connect the USB cable to the CPU of my desktop computer to charge them, and the estimated time I have timed is one hour for the LED light to illuminate blue (for the battery to be at 100%). How to pair or connect your AfterShokz Trekz Titatium headset to your Smartphone? Once your headphones battery have some charge (they do not have to be 100% charged so they can work) you have to hold the power / volume + button for about 5 to 7 seconds, until the LED light alternates between red and blue colors. First, this LED light will turn blue and you will hear a sound that will say "welcome to Trekz Titanium" and then, while keep holding this button, you will notice that the LED light starts blinking alternately between red and blue colors. Then you must activate the Blutooth of your Smartphone and wait for it to recognize the TREKZ Titanium by Aftershokz. Once it appears as "connected", you can wear on your headphones and start enjoying your favorite songs while you workout. Well, obviously you can also wear them while walking to your job or college, while driving, etc. keep in mind that the signal of these Trekz Titanium headphones has a reach between 4 and 5 meters (13 to 16 feet) from your smartphone. In order to use your Trekz Titanium Headphones with another smartphone, you must turn off your headphones (by holding the on / off / volume + button) until they turn off and vibrate. Then you have to turn them on by pressing and holding the same button until the LED light flashes between blue and red (which indicates that these headphones are looking for a connection) and then activate the Bluetooth on your other smartphone. Now, to turn off your Trekz Titanium headphones simply, as I mentioned, you must press the same button that you used to turn them on for another 5 seconds. Keep in mind that this button has the functions of on, off and volume up. Of course the volume can also be adjusted from your smartphone, and the songs should also be switched from the application of your smartphone, since these Trekz Titanium do not have an option that allows them to synchronize with the application you use to listen to music, and so it does not have buttons that perform the function of switching to the next or previous track. Are they fragile or delicate? NO, the building material is quite premium and sturdy. In addition, they can be folded without any problem to put them in the pocket, in the bag that comes in the box or elsewhere, mainly to protect them from excess dust or abundant water. Are they resistant to water and sweat? You can use them while working out even if you sweat like a beast, and they will not suffer any damage. You can also can use them to workout outdoors while it is raining in a moderate way (I do not recommend working out under a "heavy" rain for health reasons), but I do not recommend using them in torrential rain to prevent the damage of these bone conduction headphones. Of course I do not recommend using them while swimming in a pool, river or sea. Are they very stiff and make your head hurt? Its construction material is quite premium and resistant, but it does not make them heavy nor uncomfortable headphones, but quite the opposite. They are very light, moldable and resistant. They can hit the ground and will not be damaged (well, at least not at normal heights, I do not reccomend you to test their resistance by letting them fall from a tenth floor). Do they work with any smartphone? These Bone conduction headphones come with bluetooth 4.1 connection so I do not know if they work with smartphones that have previous versions of bluetooth. So far I have tested on a Xiaomi Redmi Note 4 that has bluetooth 4.1, a Lenovo Lemon X3 Lite K51c78 that also has bluetooth 4.1, with an Asus Zenfone 3 that has bluetooth 4.2, and with a Windows Phone Lumia 640 that comes with bluetooth 4.0. These Trekz Titanium headphones have worked perfectly both to listen to music and to receive calls (talk and listen without problem) with these smartphones except with the Lumia 640 (as you may notice in the images below, although I do not know if this happened because of the old version of bluetooth (4.0) or because of the operating system (windows phone) of this smartphone. What if my Trekz Titanium headphones does not recognize/pair my smartphone? First make sure that your smartphone has bluetooth version 4.1 or higher since this may be the problem. If this is a fact but still does not recognize them considering that your Trekz Titanium are in pairing mode (which is when the LED light flashes alternately between the red and blue color), then you should reset your headphones, below I'll explain how to reset your Trekz Titanium headphones. Can I hear external noise perfectly when they speak to me? Not perfectly, and also this depends on how high you have the volume of your Trekz Titanium Aftershokz. So these headphones are more made to hear some emergency warnings that can be transmited through the speakers of the gym you attend, hear the claxon of a car when you are using them in the street, and of course to avoid the hassle of having something inside of our ears. How to clean them? Well, the manual does not give an indication about it, but what I do is simply soak a piece of cotton with alcohol, drain it very well and clean my Trekz Titanium with this. Keep in mind that I sweat a lot when I train and therefore it seems to me something crucial to keep them neat. Lumia 640 (Windows Phone). Does not work, does not recognize these headphones. Xiaomi Redmi Note 4 (worked perfectly). Lenovo Lemon X3 Lite K51c78 (It worked perfectly). Asus Zenfone 3 (worked perfectly, and the connection its been made faster perhaps because this smartphone has bluetooth 4.2). How to reset your Trekz Titanium Headphones by Aftershokz ? 1. Start with the headphones off. 2. Set to pairing mode by holding down the power / volume + button for 5-7 seconds. The headphones will turn on and the LED light will blink red and blue. 3. Press and hold the multifunction button, the power / volume + button, and the volume button (the three buttons at the same time) simultaneously for 3-5 seconds. After these you will hear 2 beeps and / or vibrations. 4. Finally turn off the headphones the way you already know (by holding down the on / off / volume button +). With the above your headphones already have been reset and can be re-paired with your device (smartphone, etc.). If you have any questions about this you can do it by leaving a comment, and as soon as I can I will answer it.